Mazda is saying goodbye to the current MX-5 Miata, but that does not mean it is done tweaking it. The Japanese company will present a new concept version of the Miata, the MX-5 GT, at this weekend’s Goodwood Festival of Speed. Mazda envisions the MX-5 GT Concept as a street-legal race car. The MX-5 GT Concept borrows heavily from Mazda’s MX-5 GT racer, which was built to compete in the British GT Championship. The racecar’s center exit exhaust and other modifications yield 205 horsepower, 40 more than a stock Miata. The stripped-down racing MX-5 GT racer has an additional 70 horsepower, which gets it from 0 to 60 mph in 3.0 seconds and on to a top speed of 160 mph. That car weighs about 2,277 pounds; the street-legal MX-5 GT Concept will probably weigh a bit more. Mazda will reveal the Concept’s full performance capabilities at Goodwood. The Concept also sports adjustable suspension and a more aggressive wheel/tire package. The car also gets a carbon fiber front splitter, rear diffuser, and rear spoiler. These aerodynamic additions, along with the flared wheel arches, give the normally cute Miata an injection of testosterone. Under the MX-5 GT Concept’s hardtop, the interior is trimmed in carbon fiber, and the stock seats are replaced with heavily-bolstered Recaro buckets. Body-color roll hoops will remind everyone that this is a race car, although the roll cage isn’t as extreme as the one on the original MX-5 GT. What makes the two MX-5 GTs different? The original, British GT Championship-tested car is a full-on racer, with some professional competition under its belt. The MX-5 GT Concept is a less extreme version; it’s watered down just enough to be street legal. Whereas the MX-5 GT racer has a completely gutted interior and runs on slicks, the Concept has a lightened interior, and runs on street legal, but still grippy, tires. If the MX-5 GT racecar is the perfect tool for an endurance race, the MX-5 GT Concept is the perfect tool for a track day. Not everyone can afford to race professionally, but the MX-5 GT Concept would make a good weekend toy for the dedicated gearhead. Miatas are already popular with racers, who race them in everything from autocross to the Sports Car Club of America’s Spec Miata class. 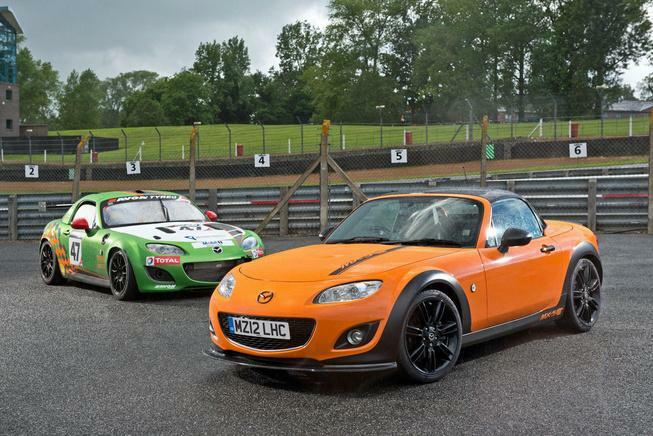 Since Goodwood is in England, the MX-5 GT will be right-hand drive. Mazda says it will gauge the public’s reaction to the car, so a production isn’t out of the question.